A huge explosion has ripped through a busy Baghdad market, killing at least 66 people, officials say. 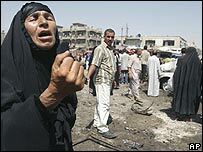 About 100 others were injured in the car bomb attack in Sadr City, a Shia area frequently targeted by insurgents. The explosion left a scene of carnage and devastation, with the dead and injured lying amid the wreckage of cars, shops and market stalls. The new government has been battling to improve Baghdad security, and last weekend unveiled a national unity plan. But the attack was the worst incident in the capital for weeks. Reports say the car bomb was detonated as a police patrol passed, causing both police and civilian casualties. The bomb was clearly aimed at causing the maximum possible casualties, says the BBC's Jim Muir in Baghdad. It was detonated at one of the busiest times of the day in a popular market in a densely-populated area. Markets - including others in Sadr City - have frequently been targeted by insurgents, causing huge loss of civilian life. In a separate incident on Saturday, a female Sunni MP and at least seven of her bodyguards were kidnapped, parliamentary sources said. Taiseer Najah al-Mashhadani is a member of the Iraqi Accordance Front, the largest parliamentary grouping of the Sunni community. The unrest comes three weeks after the government of Prime Minister Nouri Maliki imposed a major security clampdown in Baghdad in a bid to stem the wave of attacks. It was imposed only days after the leader of al-Qaeda in Iraq, Abu Musab al-Zarqawi, died in a US air strike. But on Friday, Reuters news agency quoted US Army Col Jeffrey Snow as saying the number of attacks had risen since the clampdown was imposed. As more security force patrols were on the streets, more attacks on them were being made, he said. Last weekend, in a further bid to move the country away from violence, Mr Maliki unveiled a national reconciliation plan. The 24-point plan offered an amnesty to some insurgents, and outlined plans to disarm militias and beef up Iraqi security forces ahead of a takeover from coalition forces. The plan has been criticised by a leading Sunni group, the Association of Muslim Scholars, which said it was no more than a public relations exercise.